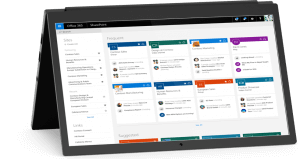 What is Sharepoint and how can it help your business grow and prosper? Use SharePoint to create custom websites where you can provide your business with a secure place to store, organise, share, and access information from almost any device.Used in conjunction with One Drive for Business it can create a powerful company intranet with document library’s, videos, Newsfeed’s & many other collaborative working features. 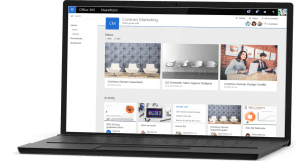 Want to learn more about how SharePoint can help your business grow? You need to stay productive wherever life takes you and now you can with the new SharePoint app (SharePoint mobile app is now available on iOS, coming to Android™ and Windows Phone in Q4 of 2016). It’s like having your company’s intranet in your pocket giving you anywhere access to your team and organizational resources needed to get work done.